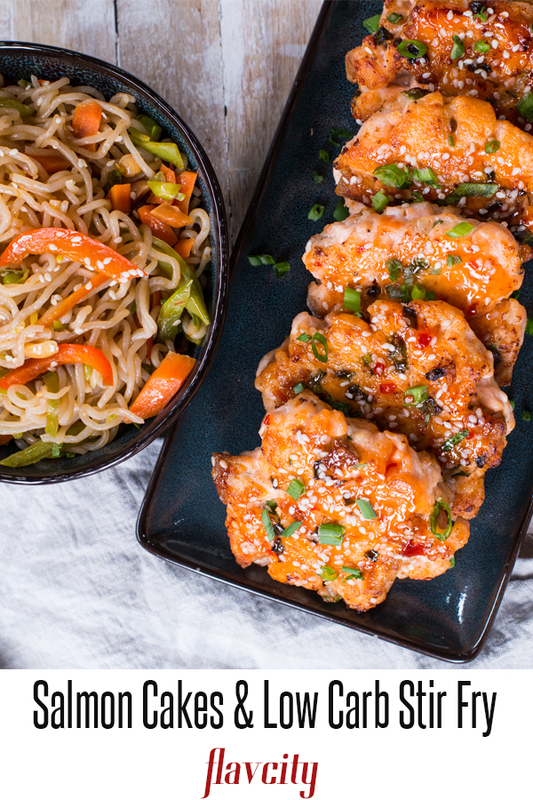 This healthy meal prep recipe has asian salmon cakes with a sweet and sticky chili sauce glaze. Served with a low carb stir fry recipe with lots of veggies and shirataki noodles. 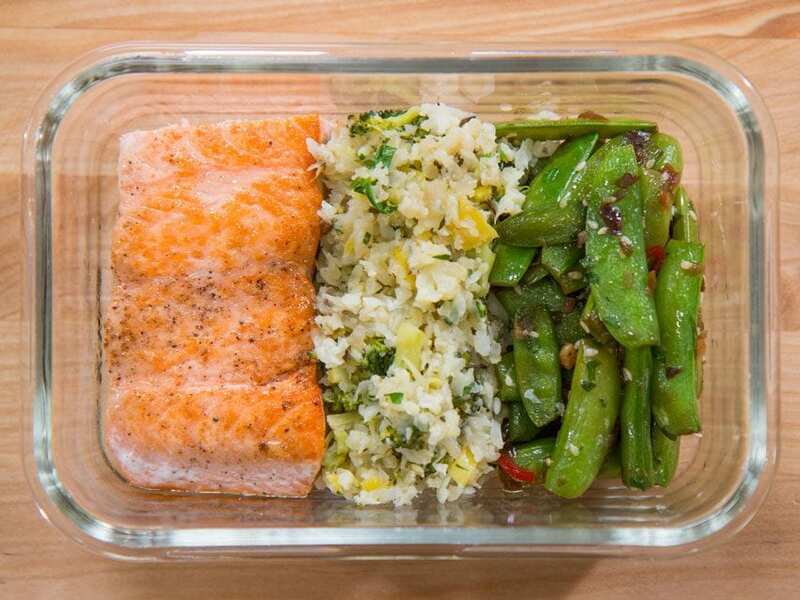 This healthy meal prep for the week is loaded with flavor, but also low in carbs. If you have not tried cooking with shirataki noodles, you need to get on it! These low carb noodles are a great sub for starchy noodles, and my favorite brand to buy is “Pasta Zero by Naysoya”. They sell it at Whole Foods and Walmart. 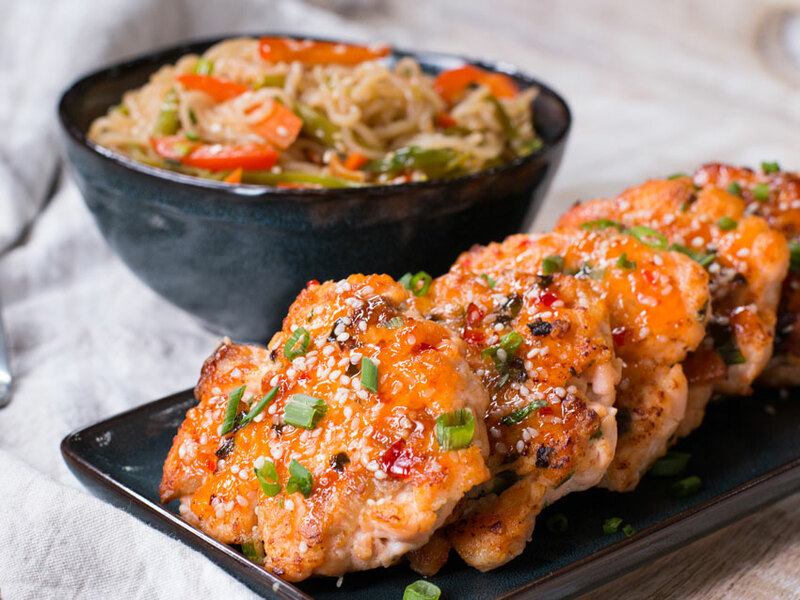 The salmon cakes are seasoned with green onions and ginger and finished in a sweet chili sauce glaze. 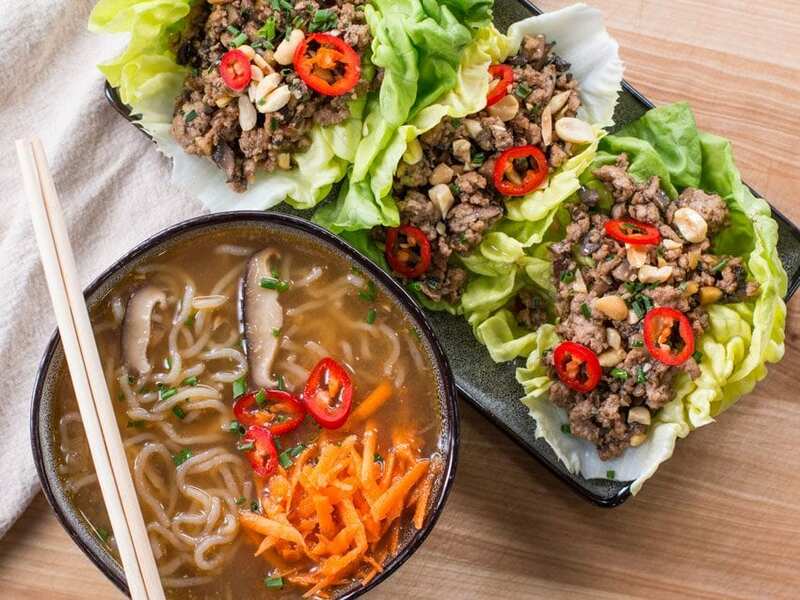 Make sure to check out my other meal prep recipes featuring Shirataki noodles like this lettuce wrap and sesame peanut noodles and low carb ramen meal prep. You don’t even need a food processor for this salmon cake recipe. Just have the fish person take the skin off and you can use a chefs knife the chop it up into a fine mince. Then add freshly grated ginger, sliced green onions, and the other ingredients listed below and form into cakes. You can also do this very quickly in a food processor if you prefer, but I figure it’s better to do fewer dishes and have more fun with a knife. Chill the salmon cakes in the fridge for 15-30 minutes and then fry in a pan. You won’t need more than 1/2 teaspoon of oil because the salmon is fatty and fries in its own oil. This recipe works best with fatty North Atlantic salmon as the salmon cakes bind together without the need of breadcrumbs or eggs. Make sure to buy good quality farm raised salmon – they sell this at whole foods. Recipe makes 10 salmon cakes for meal prep for the week. Can I Make Salmon Cakes With Canned Salmon? Yes, you can make salmon cakes with canned salmon. Just make sure to add 1 egg or 1.5 tablespoons of mayo to help bind the mixture together. You can even make the salmon cakes with wild salmon, which does not have as much fat, so just add mayo or eggs and you are good to go. If you are low carb and thought you had to give up noodles, then say hello to Shirataki noodles! These noodles only have 2 carbs per 8 ounce serving and are made from konjac flour. The key to cooking with Shirataki noodles to evaporate as much of their water content as possible. Otherwise the stir fry will get watery. Just cook the Shirataki noodles in a hot and dry non-stick pan for 6 minutes and they are ready to be used in the stir fry. To make the low carb stir fry, cook some veggies in a hot pan, add the shirataki noodles, and then season with low sodium soy sauce or amino acids. 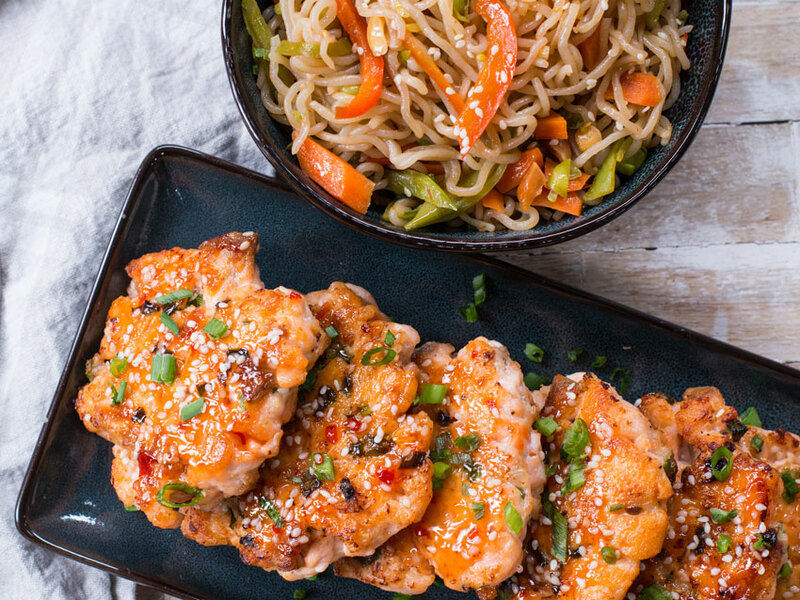 You can also use some toasted sesame oil and sriracha or chili sauce. This meal prep fr the week has salmon cakes with a sweet and sticky chili sauce glaze. 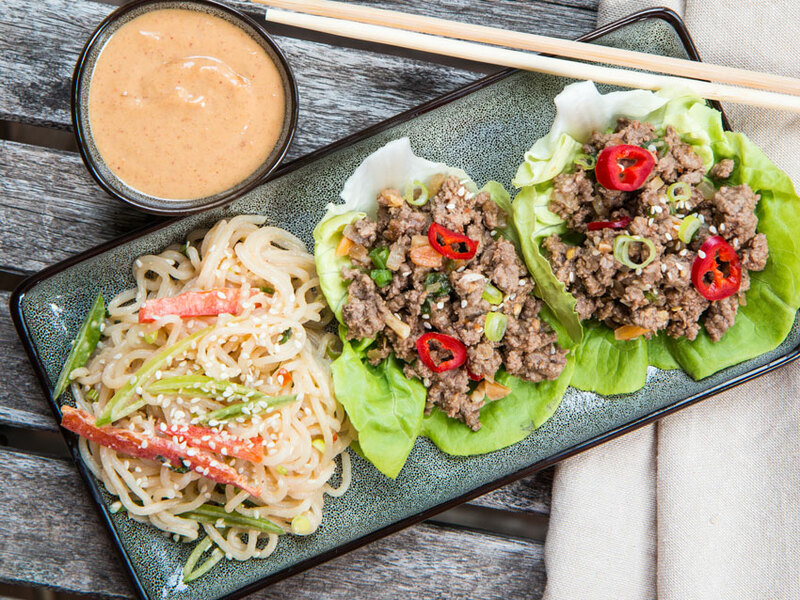 paired with an easy stir fry recipe featuring low carb shirataki noodles. Cook’s notes: When buying salmon, ask the fish person to remove the skin for you, they will be more than happy to do it. I buy “pasta zero” by Naysoya shirataki noodles at whole foods or walmart. You may have to order on walmart’s website and chose free in store pick up. On a plastic cutting board, cut the salmon into large cubes and then chop until the texture is fine, but still has some chunks of fish here and there. Transfer the salmon to a large bowl and add the grated garlic and ginger, green onions, 1 teaspoon salt, and a few cracks of pepper. Use your hands to thoroughly combine the mixture and then place in the fridge for at least 10 minutes so the mixture can chill. Meanwhile, drain the noodles from their water and add them to a large non-stick pan set over medium high heat. Cook for about 10 minutes, or until most of the moisture is gone and the bottom of the pan looks white and cakey, stirring often. Spill the noodles on a cutting board and slice them a few times so they are not tangled together, move noodles to a bowl. Pre-heat the same pan over medium-high heat with 2 teaspoons of oil for 1 minute. Add the red peppers, carrots, snap peas, and cook for 5 minutes, stirring often. Add the noodles back to the pan along with the sriracha sauce, soy/aminos, sesame oil, vinegar or juice of half a lime, and stir well. Cook for 1 minute and then check for seasoning, you will likely need more of the sauces/juices you just added, so add enough to taste. Some people like it spicy, others like it salty, totally your choice. Cook for 2 more minutes, stirring often and turn off the heat. Add the green onions and peanuts, stir to combine. Remove noodles and set aside. Using the same pan, pre-heat over medium-high heat with ½ teaspoon oil for just over 1 minute. Grab the salmon mixture from the fridge and use your hands to form a large golf ball size shape. Place in the pan and use your hand to carefully pat the ball down into a thick patty. Place a total of 5 patties in the pan and use a flat spatula to press down and make the patties a little flatter. Cook for 4 minutes or until the first side is golden brown, flip and cook another 3 minutes and then turn the heat down to low. Add 1 teaspoon of sweet chili sauce to the top of each patty and smooth it out with a spoon. Only cook another 1 minute then remove from the pan and sprinkle over some sesame seeds. Raise the heat back to medium-high and repeat with the rest of the salmon mixture, should make 10 patties total. Serve the fish cakes with some noodles and enjoy! The noodles will keep in the fridge for 5 days, but can’t be frozen. The salmon will keep in the fridge for 3 days, or can be frozen for 2 months. The best way to reheat the noodles is in a hot pan or in the oven with the container wrapped in tin foil. 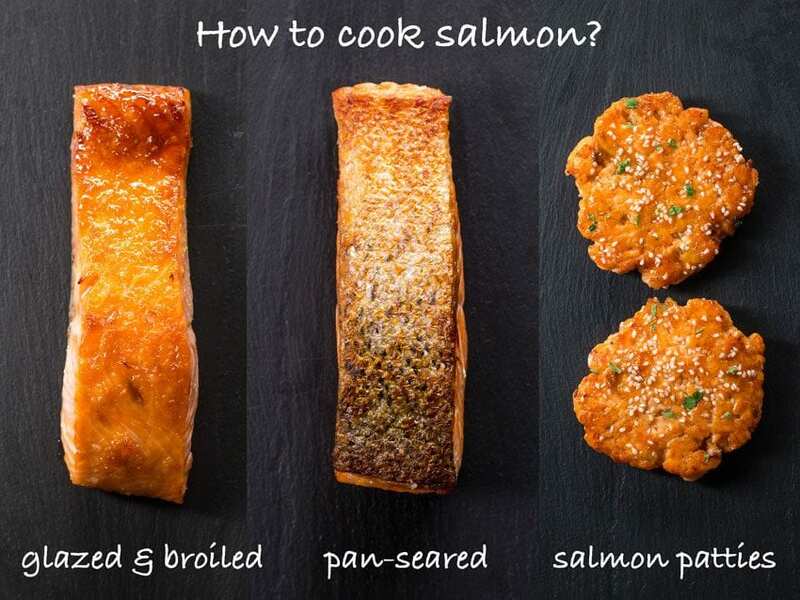 The salmon can be reheated in a tin foiled line container in a 400 F oven for 10-12 minutes, if microwaving, cover the container with a wet paper towel and make sure not to over heat or the salmon will get dry. I left it absolutely was superb!! Funny point tho — I didn’t possess some mayonnaise at the house, I moved on to make my very own lettuce however I did not possess some spirits! I made a Paleo version of avocado plus it was good of class it almost certainly substituted the calories and macros!! But it was an amazing eggless edition! This is, hands down, the BEST keto meal I have had since starting almost 1 year ago. I have had quite a few fails with the shirataki noodles before, but now I doubt I’ll ever make them any other way! The amazing flavor profile had every happy cylinder in my brain firing from the first bite. This recipe is bookmarked and definitely going into my regular meal rotation. Awesome job and keep up the fabulous work!!! Cherissa, so happy to hear it!!! I just love the salmon cakes in this recipe and the shirataki noodles are the bomb once you give the all those asian flavors! Hi, I have left over roasted salmon, can i use it for this receipe??? Marilyne, you can use the left over roasted salmon, but be sure to use eggs or mayo to bind the mixture. This recipe is 100% the definition of flavcity, amazing flavor!! Thanks Bobby !! Can’t wait to try more recipes!! Thank you Araceli! So happy to hear it! I made this recipe the other week and it was super delicious! This was my first time trying shirataki noodles and I actually really liked them. I’ve tried spaghettis squash and zuccchini noodles before as a noodle substitute before but I didn’t like their texture and how watery they would get, but these shirataki noodles are awesome and your method of cooking out the water on the stove first is great cause they definitely have a lot of water in them. The salmon cakes themselves were really good and since I was saving them for school lunch throughout the week I froze some of them to eat later in the week and they still tasted just as great. For the noodle recipe I ended up using a lot more of the ingredients for the flavor cause mines came out pretty pain when I made it, but after adding more of the recipe sauce ingredients then it tasted perfect when paired with the salmon cakes. I highly recommend this recipe because it really does taste just as good as it looks and I will totally make this recipe again in the future. That’s what I like to hear – people cooking and enjoying the food! Keep on cookin’! This is the 2nd of your recipes I’ve made this week! They are so delicious and healthy and I dont feel sluggish after eating which is great. More weight loss recipes please, they are so good!